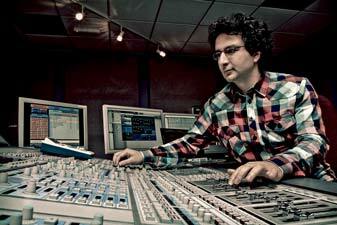 Marios Joannou Elia surpassed the established boundaries of contemporary music to become the first composer whose singular work, the open air multimedia symphony AUTOSYMPHONIC, was attended by a live audience of 20,000 people, reaching 55 million television viewers and 1,5 billion media contacts worldwide. AUTOSYMPHONIC (2010/11), written for 265 musicians and a concert arena with an area of 65,000 square meters, was acclaimed by the German media as “the event of the century”; The Huffington Post praised it as “one of the world’s more remarkable symphony concerts” and The New York Times as “a handmade, one-of-a-kind vehicle”. Winning the prestigious “Golden Apple” at the 2012 Eva Awards, AUTOSYMPHONIC’s premiere in the central square of Mannheim, Friedrichsplatz, was destined to be an event worthy of superlatives: “Gigantic, unique, spectacular – no previously cited superlatives seemed good enough to describe what AUTOSYMPHONIC would be like” (Die Rheinpfalz). Commissioned by m:con – mannheim:congress GmbH and the City of Mannheim and staged by Horst Hamann, it counts among the largest contemporary music projects in size and complexity and the most significant in terms of audience attendance and media coverage. For the 125th anniversary of the completion of Ulm Minster, the tallest church in the world, Elia has been commissioned by the City of Ulm to create and direct a new large-scale composition to serve as the cultural highlight of Germany in 2015. 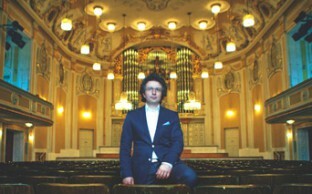 Elia became the first artist to win First Prize at all the major international composition competitions in Warsaw: the Lutosławski Award for HOLY BREAD in 2004 (premiered at Warsaw Philharmonic), the Kazimierz Serocki Award and PWM Edition’s Special Prize for VERSTECKSPIEL – HIDE-AND-SEEK in 2008 (premiered at Polish Radio Concert Hall). The year before, the Union of Composers of the Russian Federation awarded him the First Prize in honour of Edison Denisov in Moscow. He was also presented with the Theodor Körner Prize for ELPIS – HOPE at the University of Vienna, lauded by Austria’s President Heinz Fischer at the Hofburg Palace. Elia became also the first contemporary music composer to be nominated for the “Johnnie Walker Man of the Year” Award in 2011 and, in his homeland, to receive the 2010 “Artist of the Year” Award as “currently the most important cultural personality for Cyprus abroad” (Politis News). For his approx. 75 musical compositions he has received a series of highly recognized awards including the First Prize for CICADAS at the international competition in honour of Luciano Berio in New York, the Prix International “Luigi Russolo” for VERTUMNUS in Annecy/Varèse (2010) and for STROPHES, the combined BMW and Bavarian Radio Sponsorship Award from Musica Viva in Munich (2005). As a further testimony to his success, he also received compositional awards from some of Germany’s most reputable institutions: including the European Center for the Arts Hellerau in Dresden, Allianz Cultural Foundation in Munich, Akademie der Künste in Berlin, Kunststiftung Baden-Württemberg, Hanne Darboven Foundation in Hamburg and Akademie Schloss Solitude in Stuttgart. Elia’s oeuvre encompasses compositions in many diverse genres and settings such as for opera and modern concert tradition, including multimedia and prodigious projects for cultural events. The central concept of this work, “The Concept of Polymediality” (2004), is based on a qualitative polymediality that comprises two dimensions: the work-immanent composition and polymediality (alongside all the associated media) during the process of staging. Polymediality involves, amongst other elements within the musical and dramaturgical concept, the Space Factor for interior and outdoor areas. Public spaces and buildings have become a more intricate part of his compositions, as opposed to traditional concert halls and opera houses – as in AQUANAUTEN (premiered in the Mirabell Gardens in Salzburg, 2007) and the Zeitoper AS TIME GOES BY (premiered by the Hanover State Opera in the eight-storey building of the Ministry of Science and Culture of Lower Saxony, 2005). Conversely, he places non-conventional musical ‘instruments’ on classical concert stages. AUTOTRIO (2010), for example, a composition for three automobiles, 14 car musicians and electronics, was premiered in the Mozart Hall of the CC Rosengarten in Mannheim before an “enthusiastic audience of 2,300 people” (Mannheimer Morgen). Polyaesthetics arise out of the polymedial usage of materials which is systematically intended and constructed for the development of the artistic process. In this regard, hybridity is a central aspect of the concept of polymediality. On one hand (in terms of a musical amalgam, genre-like), it manifests in the confrontation between contemporary classical and popular music: In 2011, Elia composed DER TRAUM – THE DREAM for symphony orchestra, choir and the German pop music band “Söhne Mannheims”. Xavier Naidoo, Germany’s most prominent soul singer, sang the solo vocals. On the other hand, hybridity refers to original practices that comprise of a diverse spectrum of the processes of fusion. Hybridity intervenes to enunciate a third-dimensional, acoustic identity. Classification models of hybridity encompass composite instrumentation, rendering and circulation. Hybrid instrumentation takes place between atypical instrumental and vocal formations with the enclosure of extraneous sound apparatuses, as in C STORY for mixed western and non-western instruments (Muziekgebouw aan’t IJ, Amsterdam, 2006). In this context, one must view heterogeneity not as the source of conflict but as the promising condition for compositional praxis alterations in the hybrid’s value and criteria of perception. Hybrid rendering occurs in EN PLO for contrabass clarinet, double bass, electronics and loudspeaker orchestra (Akademie der Künste, Berlin, 2007): five different types of electro-acoustic transducers disseminated in space, provoke the projection of a timbral mix. Similarly in CURSED (Collegiate Church, Salzburg, 2008), the only note used is E, ten times on all the possible positions of a classical and electric guitar’s fingerboard. Hybrid diffusion ensues in a cycle in which an existing mosaical structure or a mini hybridized particle is exploited in a new context, or serves to generate another composite assemblage (AKANTHAI – THORNS). By the incorporation of non-conventional instruments in his music, Elia was critically acclaimed as a “sound magician” (Salzburger Nachrichten) “with idiosyncratic sound worlds” (Welt am Sonntag). Particularly known is his “vehicle cycle”: Bicycles in DER WEGWEISER – THE SIGNPOST (Berlin Philharmonic, 2005), motorcycles in TEMPUS TANTUM NOSTRUM EST – NOTHING IS OURS EXCEPT TIME (Salzburg Biennale, 2009), aviation elements in DIE REISE DES GUIDO MASTORNA – GUIDO MASTORNA’S JOURNEY (Amadeus Terminal 2 of the Salzburg Airport, in context with the Mozart Year festivities, 2006) and naval elements in EN PLO – AT SEA (2007). All of these elements will play a role in creating sonic components for each piece. The car had already been used as an artistic medium in the development of STROPHES for the foyer of the Volkswagen Transparent Factory in Dresden (2003/04) as well as for the premiere of the opera DIE JAGD – THE HUNT in the large Showroom of the Schwabengarage, Stuttgart (2008). In 2010, for the celebration of the 125th anniversary of the invention of the automobile, Elia created “the world’s first automobile orchestra” (Deccan Herald of India) after a 10-month car casting all over Germany: a “spectacular musical tribute to Carl Benz” (Deutsche Welle). The environment thus becomes the medium for generating the music: The sounds the cars made served as the basis for a nine-movement symphony, written for a large symphony orchestra, an automobile orchestra, an adult chorus and a children’s choir. The automobile orchestra consisted of 80 vehicles, from classic to modern super cars, busses and trucks (e.g. Mercedes-Benz SLS and Actros, Audi R8, Porsche 356 and 911, Ferrari California and Rolls-Royce Silvercloud). In collaboration with the Baden-Württemberg Popular Music Academy 120 youths were especially trained a year long for the occasion to elicit the approx. 800 sounds from the automobiles to interact with the symphony orchestra and choir. 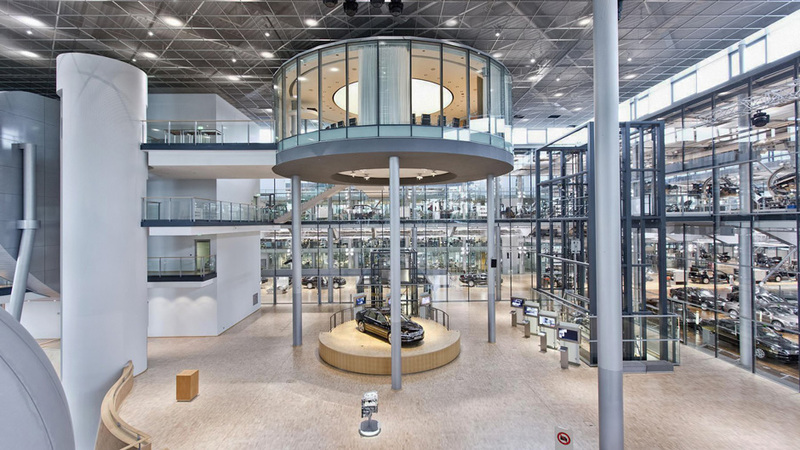 STROPHES (2003/04) – The Volkswagen Transparent Factory in Dresden. 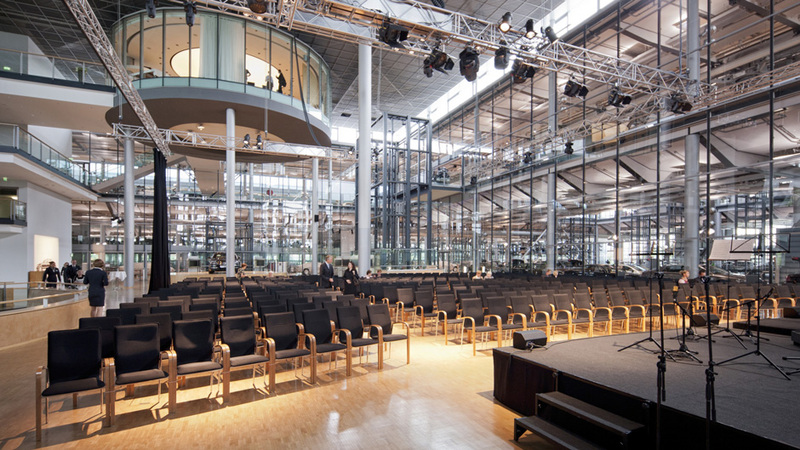 STROPHES (2003/04) – The Volkswagen Transparent Factory in Dresden transformed into a concert hall. Elia was born in Pafos, Cyprus, in 1978. 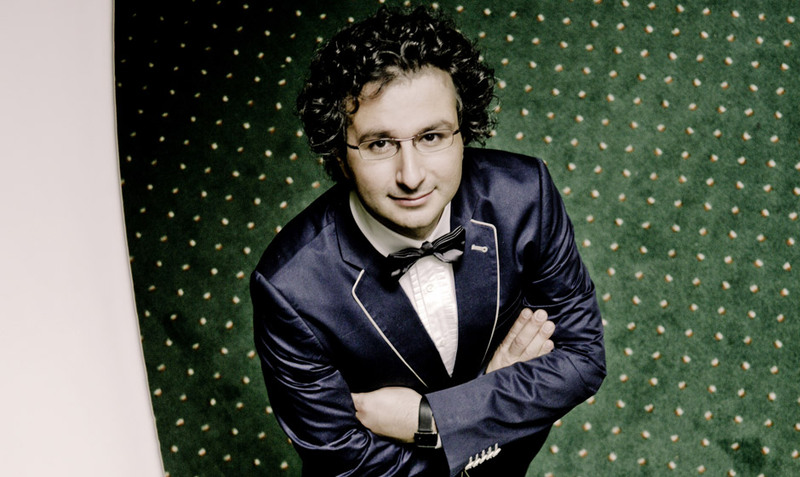 He began his career in composition by attending the University of Music and Dramatic Arts, Mozarteum in Salzburg in 1998 with Adriana Hölszky. Additionally, he studied classical guitar, music pedagogy, music theory and audio-visual media. He also studied composition with Michael Finnissy in Southampton, Klaus Huber in Basel and Bogusław Schaeffer in Salzburg, and went to engage with Karlheinz Stockhausen in Kürten/Cologne and Helmut Lachenmann in Darmstadt. 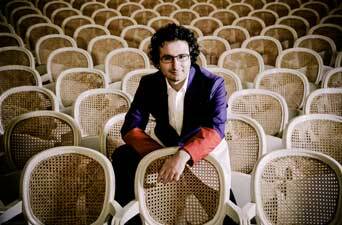 Between 2007 and 2009 he undertook musicological research at the University for Music and Performing Arts in Vienna. In 2010 he was awarded a Doctorate of Philosophy from the University of Southampton. 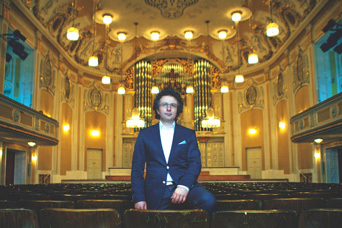 The recognition of his exceptional creative output came early: In 2002, after he received the Mozarteum Chancellor’s Award for Excellence (“best student of the academic year”) and the Achievement Grant Award by the Austrian Federal Ministry of Education, the Arts and Culture, the New Music Society of the University of Cambridge premiered WITH A PAIR OF SCISSORS AND THOUSAND THREADS, the only piece in guitar literature that requires a guitarist to perform simultaneously on two differently tuned guitars. In 2004/05 three of Salzburg’s theaters held feature-length portrait concerts dedicated to his oeuvre. A key milestone in his career was the opera DIE JAGD (Libretto by Marianne Freidig/Andreas Liebmann), subtitled Naturoper mit Autos – opera for nature and cars, an allusion to Shakespeare’s A Midsummer Night’s Dream. Premiered by the Stuttgart State Opera in collaboration with the State Theater Rampe, Stuttgart in 2008, it became headline at ARD “Tagesthemen”, Germany’s main television news magazine. The German Press Agency (dpa) referred to “a grand opera: this time with a very unique twist”, whose all six performances were sold out. However, Elia’s initial commissioned works were not immediately accepted. In 2006, two operatic projects, one to be premiered at the Margravial Opera House in Bayreuth celebrating Mozart’s 250th birthday (DER FLÖTENZAUBERFLÖTE; Libretto by Goethe/Elia) and another at Mozarteum’s large theatre studio in Salzburg celebrating the University’s main building rebuilt (OROMUMPAQ; Libretto by Simon Werle), were cancelled due to the unorthodox and demanding approach of the composer towards the music theatre form. However, this innovative and visionary attitude gained international recognition by the end of that same year: Udo Zimmermann, influential German intendant, emphasized during a laudation in the Hercules Hall in Munich on Elia’s STROPHES that it “requires not only an extraordinary instrumentation but also a highly imaginative and unusual environment. The composition demands the courage to use such means”. At the same time, for musicians and audiences alike, his music provides sheer delight: at the International Music Today Festival of the Korean Society of the 21st Century Music in Seoul he wins the Audience Award. 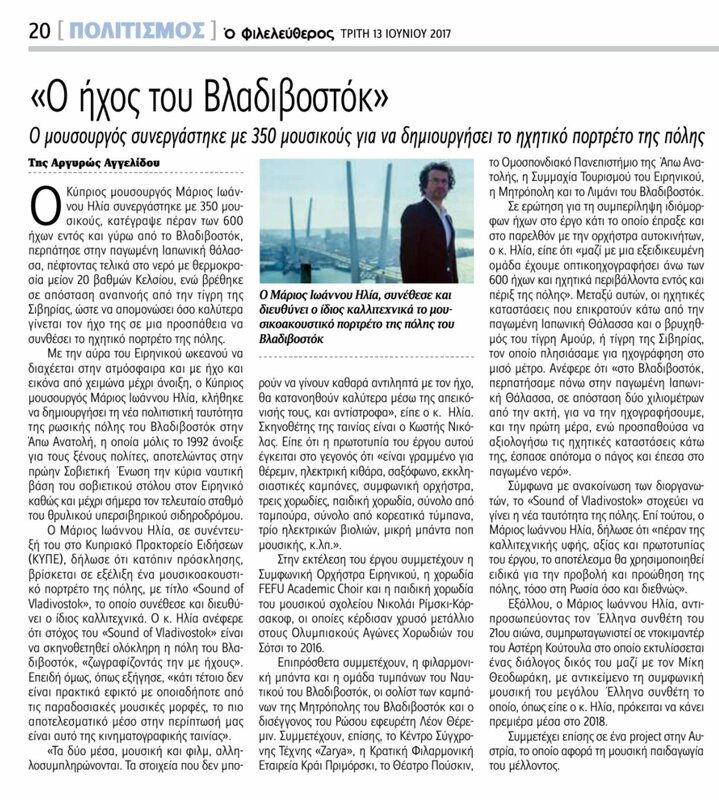 Shortly thereafter, a review in the Frankfurter Allgemeine Zeitung praised the adventurous element in Elia’s concert music, with respect to AKANTHAI‘s premiere by Ensemble Modern under Stefan Asbury/Hsiao-Lin Liao in Frankfurt: “A musical border traffic in which all lights were switched to green”. HYDOR CHRONOS was included in the performance repertoire of the Salzburg Easter Music Festival and a series of works at the Klangspuren Festival of Contemporary Music in Schwaz, Austria. Here the Austrian Ensemble for New Music premiered the “thrilling THALATTA, THALATTA!” (Der Standard), the Ensemble Recherche performed the first version of VERSTECKSPIEL, for which he was awarded the First Prize at the festival, and Ensemble Modern under Franck Ollu HOLY BREAD. Additionally, a composer’s portrait concert took place in the Akademie der Künste in Berlin, presented by Adriana Hölszky and the Kammerensemble Neue Musik Berlin. 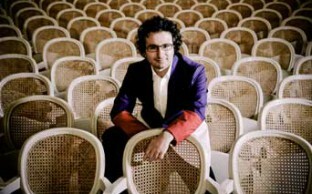 Elia’s music is now performed worldwide by prominent orchestras and ensembles such as the SWR Baden-Baden and Freiburg Symphony Orchestra, German Radio Philharmonic Orchestra Saarbrücken-Kaiserslautern, Ensemble Modern, Sinfonietta of the Leipzig Gewandhaus Orchestra, Stuttgart State Opera Children’s Chorus, Ensemble Phoenix (Basel), Ensemble Ascolta (Stuttgart) and the Moscow Contemporary Music Ensemble. One striking feature of his music is the expansive usage of percussion elements (percussivity). This could be heard most noticeably for the first time in STAUBZUCKER – POWDERED SUGAR, written for the Miscelanea Guitar Quartet, and which today is the most performed work of Elia. Since its premiere in 2007 at the Solitär Concert Hall in Salzburg, the piece counts over hundred performances “which one is not likely to forget” (Classical Guitar Magazine) all around Europe, South America and the United Sates. In AUTOSYMPHONIC the automobile orchestra is played by drummers alongside the AUTOTRIO. Even the choral music in MAN AND MACHINE (2010/11), premiered by the SWR Vokalensemble Stuttgart, is composed in a mechanically percussive style and encloses fascinating vocalities that lie outside the normal range of the human voice. The latter concept reflects the composer’s interest in the interaction between man and machine. In this regard, the employment of electronic media and advanced technology obtains a central role. Together with Nick Elia, producer of electronic music, a series of projects were realized such as VERTUMNUS for loudspeaker orchestra and three-dimensional interactive shadow puppetry, premiered on the big stage of the Macedonian Opera and Ballet in Skopje in 2009. In that same year AIRDANCE was premiered at the Ars Electronica Center in Linz by the Absolute Quartet (Absolute Machines). The piece is written for an automated electromechanical orchestra, an oversized marimba played by rubber balls shot from a robotic cannon and a series of spinning wineglasses dampened by robotic fingers. In AUTOSYMPHONIC a 360-degree sound system in 14.1 surround format was installed, thus embracing the twelve stages placed all around the Friedrichsplatz Square (on one semicircle the car orchestra; opposite the symphony orchestra, choir and four percussion platforms). Additional sophisticated equipment supported the work’s performance including Matrix3 and D-Mitri. A number of his pieces like C STORY and WHITEBLACK (2003/05) were composed as a response to the 1974 Turkish invasion, the cataclysmic event in contemporary Cypriot history. 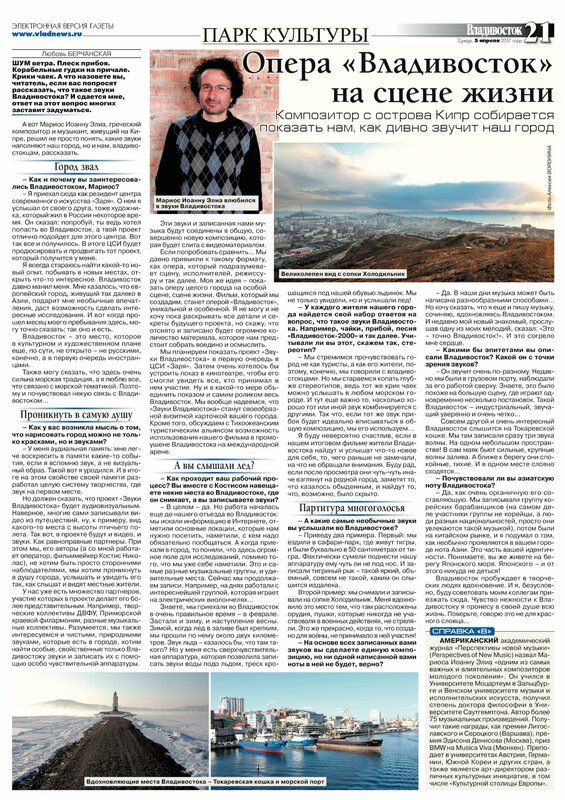 What concerns him is not the ethnic demarcation lines, but an attempt to exorcise the tragedy and, moreover, a general humanistic and antiwar commitment. The same intentions appear in the simplistic, epigrammatic poems of Costas Montis, an important Cypriot poet, whose verses are often traceable in Elia’s music. A central meaning here possesses the application of textual elements and vocality in his instrumental works, as in HOLY BREAD (orig. ANTIDORON) for amplified string quartet, subtitled Requiem for Costas Montis (2004, Konzerthaus Berlin), ELPIS for accordion orchestra (2006/07, Muziekgebouw aan’t IJ Amsterdam) and AKANTHAI for large orchestra (2006/09, Great Broadcasting Hall of the Saarland Radio). It is worth mentioning at this juncture that the critical expression is partly achieved by the interjection of humorous allegorical elements. Influenced by the ancient Greek comedies and the idiom of Greek-Cypriot dialect, the element of humour is particularly present in his theatrical and semi-theatrical pieces for voices, like DREI LÖFFEL ZUCKER IM MEER – THREE SPOONS OF SUGAR IN THE OCEAN (2005, Toihaus Theater Salzburg; with actor Max Simonischek in the leading role).